The ungraded, $100,000 Smarty Jones Stakes on Jan 16 kicked off the Oaklawn Park prep series for Kentucky Derby 2012 contenders and Junebugred sat the right trip under Joe Bravo. Junebugred, a lightly raced 3yo son of Corinthian, saved ground from post 2 and was always full of run. He scooted through along the rail in the stretch and prevailed by a neck, stopping the clock in 1:38.45 for the flat mile journey and paying $14.80. Reckless Jerry raced wide from post 12 and probably would have won with a better draw. He was slowly gaining late and can turn the tables on Junebugred next time. 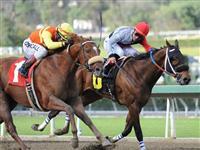 Fabulous filly On Fire Baby was hardly disgraced in a solid show finish. She also raced wide from post 10 in her first start since November and can go better next out.